Magazine sales decline as more people find all their content on the web, and with a blog the interaction is often immediate, with comments being added and answered within minutes of the blog being posted. Not all are like that, some bloggers don't have time to moderate comments and don't want to leave the gate open to spammers - one comment I did not allow through today was apparently innocent, but if you click on the username it linked to a website about pressure cookers! These are arranged chronologically, so the most recently updated is at the top. Some are no longer being updated - those stay at the bottom of the list - but contain some very useful and interesting information. Others are very specialised, but often contain some general observations on the hobby or trade as well. You can click on the main blog title, or individual entries. 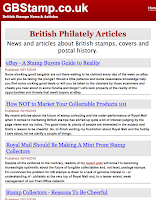 Recently GBStamps has posted a series of observations on how stamps ought to be marketed by the postal authority, specifically Royal Mail, why collectors should be cheerful, and a reality check for buying (and selling) on eBay. There's no direct comment facility on this site, but if you go to the home page, there is a discrete 'Contact Us' link in the right-hand panel, so if you have something to add, go ahead. I'm sure your feedback will be welcomed. 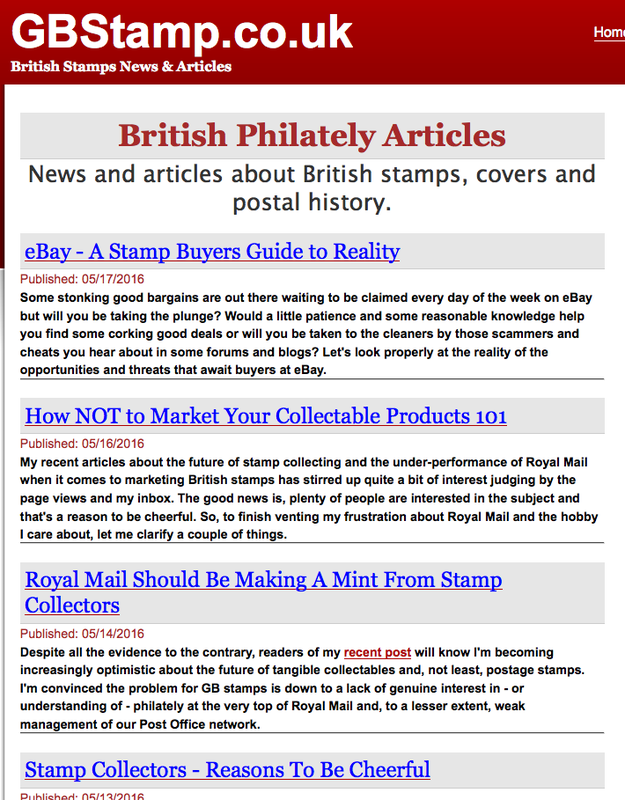 Hi Ian and thank you for highlighting our content at GB Stamp. Your explanation about the absence of a comment system was spot on. I would love to offer such a facility but cannot guarantee speedy moderation of submissions yet. However, I value your advice and have now added a prominent email link at the top right of every article for people to use if they wish. On a similar note I've long wanted to host a forum specifically for the GB hobby. However, without a few reasonably knowledgable people to share the moderating involved, it's not something I dare do. Having been a moderator on forums for more years than I care to remember, I know it's not something to try and gloss over. However, with that now said, if between us we can form a crack moderator team, then my offer to set up and host a mutually owned and managed forum on an independent domain name will remain open if it interests you and/or any interested readers. I've long admired the quality of content you produce here, both on the blog and website. It's a fantastic resource for collectors of modern GB and I can't hope to add anything of value to what you already do. So, recognising content duplication across several websites is pretty pointless, I tend to focus on the little niche topics surrounding the hobby while also offering a few thoughts that might, hopefully, get people thinking for a moment and forming some positive opinions about our hobby too. Let's hope more philatelic websites get inspired by your post and realise we can all achieve a lot more by link building between us to give stamps and philately a much needed online boost. Who knows, if we can show stamp collectors/dealers/philatelists really are a friendly and helpful bunch, then the hobby may start attracting a few more people. If we stay fragmented or appear to be cliquey then I doubt any amount of effort will get the results I hope we all want. I'd like to thank Ian for this blog aswell, informative, relevant and interesting reads. I think Graham hit the nail on the head with his comments. I stopped my annual subscriptions of both the Philatelic Explorer and the Stanley Gibbons monthly Stamp Magazine because I was fed up with buying a magazine that had almost 30% of the print for an advert for Universal Philatelic Auctions.While I appreciate they have paid for the adverts and they are probably almost single handedly keeping the print going, I flicked through 42 pages for their next auction of a 147 page magazine (Jan 2016).